The news keeps getting for Ferris State fans. The Bulldogs went 7-3 in coach Tony Annesse’s debut season. Now they have received a commitment from Ryheem Stokes, the top senior in Grand Rapids. 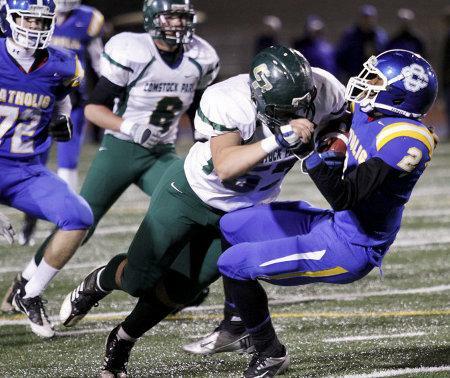 Stokes, 5-10, 170, did it all for 10-1 Grand Rapids Catholic Central. He’s a true playmaker, a threat whenever he got his hands on the ball. Stokes scored TDs this season running, catching, returning a kick, after making an interception and after recovering a blocked kick. With the 2012 high school football season officially in the books, recruiting efforts are kicking into high gear for the state’s senior college football prospects. As players strive to catch the attention of college coaches with highlight films and on-campus visits, there’s a new opportunity on Sunday, Dec. 2 in Grand Rapids. The Lake Michigan Football Report’s Senior Exposure Camp will bring college coaches and high school seniors together under one roof for an afternoon of talent evaluation and networking. With so many great players competing during the high school season, it can be difficult for college coaches to see each and every player with college potential. The idea of this event is simple: bring together top high school seniors and allow them to showcase their skills in front of college coaches. Players who can stand out amongst top competition will generate the most interest. The interest from college coaches wanting to scout players at this first-time event has been strong. Coaches have confirmed their attendance from more than a dozen programs, including from Ferris State, Grand Valley State, Hillsdale, Michigan Tech, Northern Michigan, Northwood, Saginaw Valley State, Wayne State, Alma, Hope, Ohio Northern, Albion, Adrian, Wabash, Olivet, and Trine. The interest from the state’s top players has been strong as well. Numerous players with state championships and All-State, All-Area, and All-Conference honors have registered, including Trevor Sweeney (Mattawan), The Lake’s #1 RB prospect of the 2013 class. Sweeney had a break-out season for Mattawan, rushing for 1,754 yards en route to unanimous Division 1-2 Associate Press First-Team All-State honors. Sweeney has drawn interest from Western Michigan and several Division 2 schools. Other outstanding prospects registered include The Lake’s No. 1 ranked senior QB prospect, Zeeland East’s Michael Custer; All-Lake WR Trent Karcher of Chippewa Hills; All-Lake RB John King of Muskegon; All-Lake LB Seth VanEngen and DB/WR/QB Derek Woltjer, two of five athletes registered from state champion Grand Rapids South Christian; from Mancelona, All-State RB Wyatt Derrer and All-Lake OL Dalton Sulz; Lowell ATH Reed Stormzand; All-Lake LB Matthew Hall of state champion Grand Rapids Christian; All-Lake ATH Andon Ware of Baldwin; All-Lake RB Geovante Weston from Kalamazoo Hackett; from state semifinalist Comstock Park, All-Lake QB Jake Brown and All-Lake DL Blake Mazur; out of Schoolcraft, All-Lake TE Zachary Decker; Hamilton QB Nick Kronemeyer; All-Lake LB Nathan Pupel from Traverse City Central and also from TC Central, ATH TJ Schepperly; West Ottawa QB Trevor Van Tubbergan; All-Lake OL Casey Mesbergen of Zeeland West; and one of the state’s top juniors getting a head start on the off-season, All-Lake LB Jacob Howe of Forest Hills Northern. 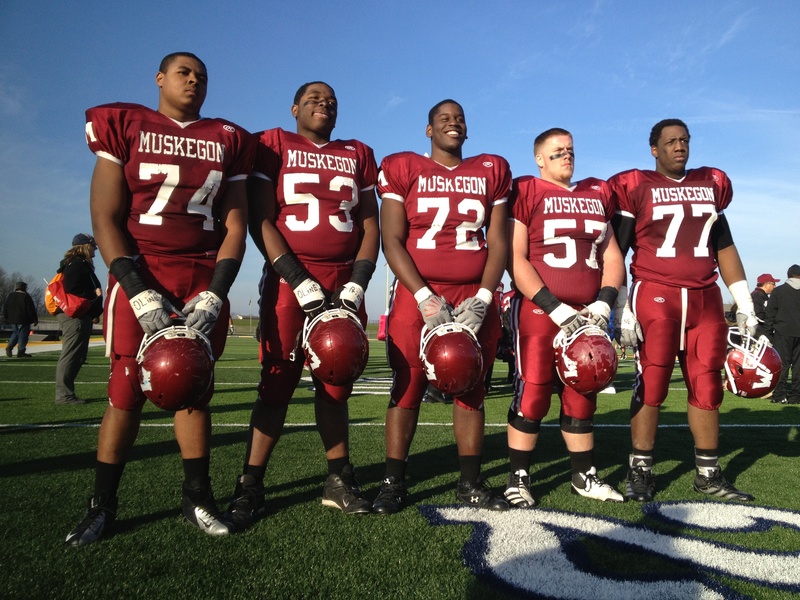 Division 2 schools have become an attractive option for many of the state’s talented prospects. It’s a trend that’s understandable, as the Division 2 landscape has changed quite a bit over the last decade. The GLIAC is arguably the best Division 2 conference in the country, and boasts an interesting statistic: currently, there are more former high school players from Michigan in the NFL by way of the Division 2 GLIAC than the Division 1 MAC. Division 3 schools also provide a great opportunity for student-athletes to pursue their education and sport at the next level. In fact, there are more football programs available at the Division 3 level than any other level. While “athletic” scholarships are not available in Division 3, financial aid packages are available based on academic performance and financial need. During the camp, players will have their 40-yard dash timed before competing in position-specific and one-on-one drills. They will also be able to speak with college coaches and exchange highlight film in a post-event meet-and-greet. All players who have yet to secure college scholarship offers or who want to broaden their recruiting pool are encouraged to sign-up by December 1st. Registration is available online at LakeMichiganFootballReport.com/SeniorExposureCamp. 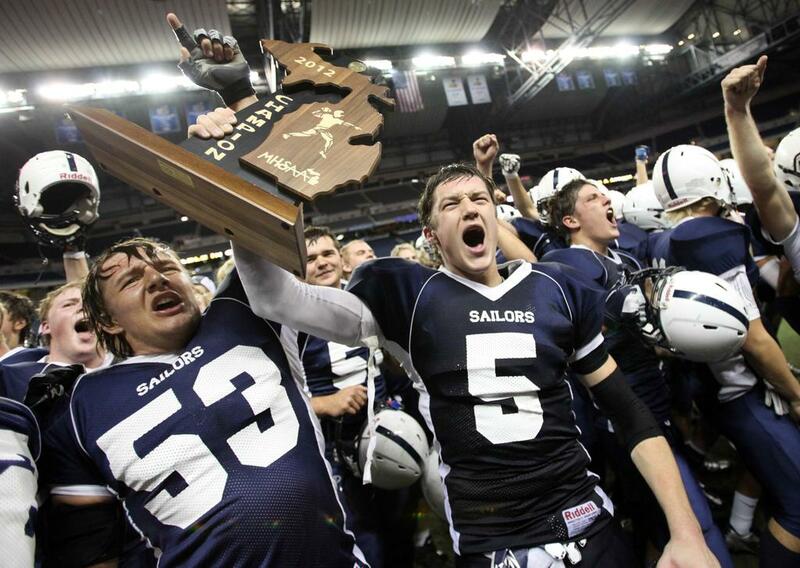 GR South Christian celebrates their 2012 Division 4 state title at Ford Field. Photo: Jarrad Henderson/DFP. Grand Rapids South Christian entered the playoffs 6-3, not on the radar other than showing some resolve to qualify, and for some young talent on the roster. But after the most prominent of those players, sophomore quarterback Jon Wassink, broke his collarbone in the semifinals, few gave the Sailors a chance in Friday night’s Division 4 state championship game with Detroit Country Day. Maybe a defense that delivered throughout the playoffs would at least keep the score respectable. The defense did more than that, and who could have imagined that backup QB Derek Woltjer would fulfill his moment in cinematic fashion and South Christian would win 40-7. Woltjer, a 5-11, 165 senior, moved over from flanker and ran for two TDs and threw for two more while not having one incomplete pass. He ran like, well, a running back, totaling 136 yards, including a 69-yard TD. Woltjer played both ways, and added a 28-yard interception return. South Christian consistently picked up yardage on first and second downs, keeping Woltjer out of scary third-and-longs. When he did throw it he hit, completing 7-of-7 passes for 88 yards, including a 41-yard TD to senior receiver Jason Miller. Seth VanEngen was the defensive MVP of a unit that for the third time in the playoffs held the opponent to a max of one TD, this one a 54-yard catch-and-run by Country Day’s promising receiver prospect Maurice Ways. VanEngen’s a 6-5, 215 senior linebacker who made plays up and down scrimmage and led South Christian with seven tackles, including one behind the line. He also made crucial blocks both on offensive and special teams, and had a receiving first down. South Christian’s three down linemen — 6-4, 230 junior Todd Postma, 6-3, 230 soph Mitchell Quakkelaar and 6-1, 275 soph nose guard Brendan Huyser — were too athletic for a very legit DCD offensive line. They opened the way for Sailors linebackers VanEngen, junior David Boomsma, senior Jordan Sundelius and senior Alex Haan — to hold DCD’s star back Richard Wilson to 53 yards on 11 carries. Quakkelaar twice brought the wood on Jackets QB Tyler Wiegers, one of them for a nine-yard sack loss. That was a common theme for Quakkelaar throughout the playoffs, which is why he’s one of the Lake’s top early prospects for 2015. While South Christian rightfully celebrates its 2012 championship, there will be high expecations for coach Mark Tamminga‘s. They will five starters returning on defense in 2013, not to mention the best player who didn’t see the field Friday — Jon Wassink. Senior Exposure Camp is Sunday, Dec. 2 in Grand Rapids! Senior Exposure Camp set for December 2nd in Grand Rapids!